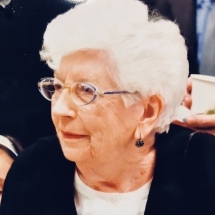 Doris Chisholm Harper, 97, of Ridgewood, NJ, passed away peacefully, surrounded by her loving family on June 26, 2018. Doris was predeceased by her husband, Robert D. Harper SR, of Bergenfield, NJ, in 1981, and by her two sons, David J. Harper SR, of Ridgewood, NJ, in 2010, and Robert D. Harper JR, of Westchester, NY, in 2017. She is survived by her adoring grandchildren, Emily (Matthew Gilfus), David, Robert (Kate Nelson), Christine, and Scott, and great-grandson, Charlie. A funeral service will take place at Saint Elizabeth's Episcopal Church in Ridgewood, NJ, followed by interment at George Washington Memorial Park in Paramus, NJ. In lieu of flowers, donations can be made in Doris’ memory to the Saint Elizabeth’s Episcopal Church at stesridgewood.org.